Sometimes life just gets too much to process. Natural disasters. Nuclear reactors on the verge. Homeland Security. Social insecurities. We each do what we can to help, and then in the end it is difficult to face the reality of our limitations despite our best intentions. On this aberrantly cold 'Spring' night in LA, with so much tragedy on a global level, and an insanely stressful week at work on a personal one, I dragged my weary body to Studio City, seeking shelter at Ramen Jinya. Knowing I can sneak a selfish moment of comfort in its steaming bowls. Located in an unassuming corner storefront in a non-descript mall in Studio City, lodged between of all things an Office Depot and a Marshalls, Ramen Jinya at first sight does not seem like a place you would go for authentic, amazing Japanese. But set one foot inside the place and you feel like you've stepped into some cozy neighborhood noodle joint in Tokyo - almost all of Ramen Jinya's bustling workers are Japanese who speak English with an accent, and although there is energy to the place, I would describe the vibe as sort of a respectful, pleasant hush over a casual crowd - the din typical of small spaces with a constant flow of guests is noticeably absent - conversations were flowing, but people didn't seem to think everyone across the room needed to hear their brilliant insights on whatever. People seemed focused on their food and enjoying it. And along the bar, aligned with the open kitchen perched patrons who could have just come off the commuter train, there for a quick meal before heading home. I settled in with others at the short bar, loving the view into the open kitchen where the magic happens. I am not at all a ramen expert - and in fact until a few years ago associated it with subsistence dorm dining, a simple meal in a styrofoam cup, 'cooked' in boiled tap water, flavored with various powders imitating taste. I only discovered the beautiful, clean flavors of a well executed bowl of made-from-scratch-ramen relatively recently, after being introduced to some authentic places by co-workers at my last job at a Japanese company. And now the office of my current job is a short drive away from Ramen Jinya! I've visited several times already - and it takes a lot for me to repeat visits, since there are so many places in LA I still want to try, with such limited time and resources! So if I go back to a place, it's either because I think it's amazing, and/or it offers really great value for the price. On this particular night - my 4th visit! - I opted for the Tokyo Tonkotsu Ramen ($8.55) with pork & bonito broth with pork chashu, spinach, green onion. This was the perfect balance of broth to noodles to slight crunch added by green onions and bamboo shoots to fluffy, juicy leafs of spinach to fatty pork so tender it falls away at the slightest flick of your chopsticks. It's served at just the right temperature, with tendrils of fragrant steam wafting up to your face to whet your appetite. I think of this as 'surf n turf ramen' - with gorgeous, soft slabs of pork in broth made from that and bonito from the sea. The bowl was perfect in itself, but I opted to add one topping from the 'make your own ramen' menu - Special Flavored Egg (Half Cooked) for $1. This reminded me of Chinese 'tea eggs', pre-marinated in soy sauce and spices - but with a liquid gold center so creamy and tasty it made my toes curl. On the first and one other visit, I had been drawn to the Hakata Tonkotsu Ramen ($9.55) - of course as it was noted as "limited to 20 servings per day". Being a marketing nerd, that messaging definitely appealed with its sense of rarity and drove 'urgency to buy'. This bowl consisted of premium rich flavored pork broth with pork chashu, spinach, and green onion. For me at least, the broth was a bit too rich - sometimes premium doesn't mean best! 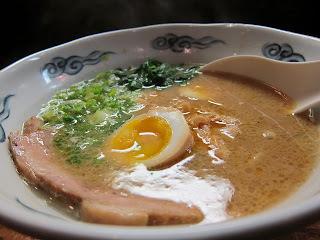 I liked the Hakata but preferred the cleaner tasting Tokyo Tonkotsu. In the end, Ramen Jinya hits the spot every time. I don't know what Jinya properly translates to - but its kanji, or name in Chinese characters, would directly translate to something like 'Fortress Home' - which is interesting, is it to convey to guests that it's safe to eat there? That its noodles are so good that it needs to be carefully guarded, though at the same time the place is as welcoming as a second home? All I know is, whenever I need to escape from the daily wear and tear of life, I know I can count on Ramen Jinya for a steaming bowl of all that is right in the world. okay, they have a veggie option? i'm in.